Product code: ES8361 Categories: Art Deco, Art Deco Bracelet. Here is such a beautiful and elegant French Art Deco diamond bracelet made in the 1920’s that is so sleek and comfortable to wear all the time day or night and will no doubt always be loved and admired. Hand made in 18 carat yellow gold and platinum, the gold links measure 5.8mm wide and have such a smooth tactile feel to it that makes it so comfortable. The way the links are intertwined give the bracelet such a unique look to it and highlights why genuine Art Deco pieces of jewellery such as this are so popular and sought after, even after all the years that have passed since it was made. With three European cut diamonds that are set in platinum, these diamonds total 0.85 carats and highlight the bracelet so well and exemplify the quality of Art Deco jewellery as the diamonds don’t overshadow the piece as a whole making it practical to wear during the day as well as well into the night for those special occasions. Measuring 20cm from end to end, it is fitted with a safety clasp for added security and is a bracelet that will always be admired every time that it is worn. 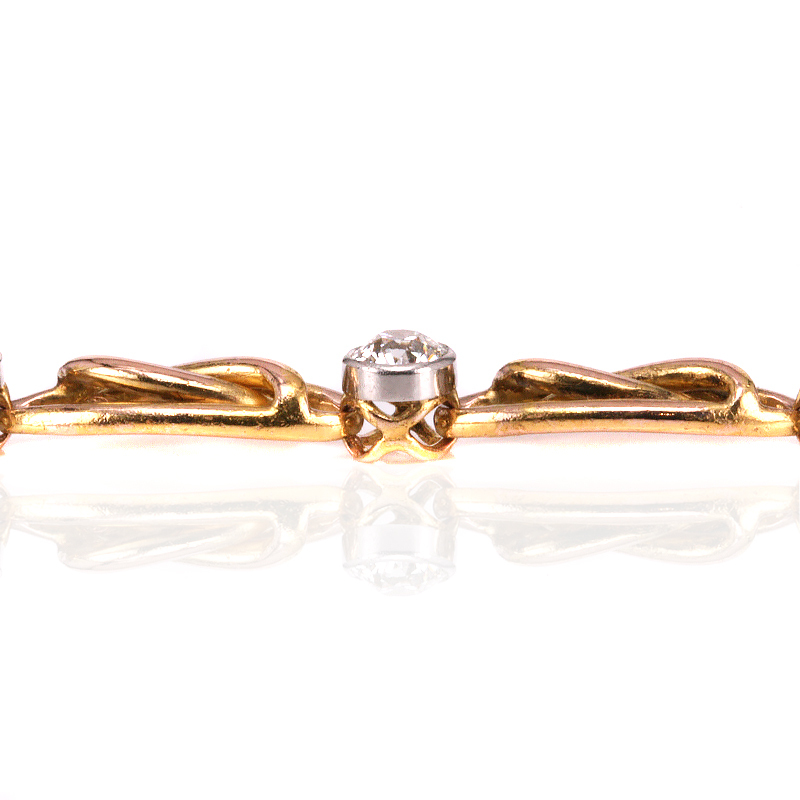 This diamond bracelet was hand made in 18 carat yellow gold and platinum during the Art Deco period of the 1920’s. 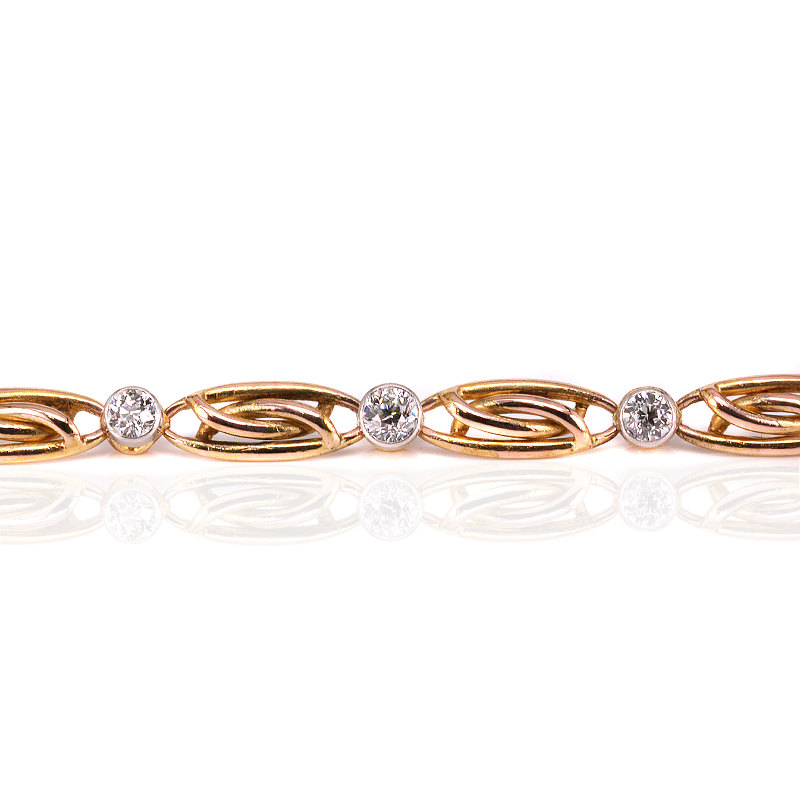 Set with three European cut diamonds, this bracelet is so easy and comfortable to wear all the time. The Art Deco era was from the 1920’s to the 1940’s and has remained one of the most popular eras in the history of jewellery as well as architecture. From fabulous Art Deco jewellery from companies such as Cartier and Boucheron, to iconic buildings such as the Chrysler Building, the Art Deco era is one that is still so influential even today.